This article reviews the 'Location' field while creating or editing live training events - this field can be used to help manage your resources if you have many people scheduling training on your Skilljar dashboard. For more information about creating live training events in general, check out Managing Live Training Events. When creating or editing a calendar event, you will see a picklist for 'Location'. This list will show all the locations that the organization has used for events in the past. This field also supports free form text entry, allowing admins to enter in a new location. If a new location is entered and the event is saved, the location will be saved and will be available in the picklist for future use. If you would like to update this to be a static list of pre-set locations - it is possible to do this by working with your Implementation or Customer Success Manager. You can also set this up by reaching out to support@skilljar.com. If needed, it is possible to only allow a single live training event to use a given Location at a time. This will allow you to block the scheduling of a live event at a specific location if that location has already been selected for another live training event which occurs at the same time. The error message above will surface if you select a location that is already being used at the same time as an event that has already been saved. 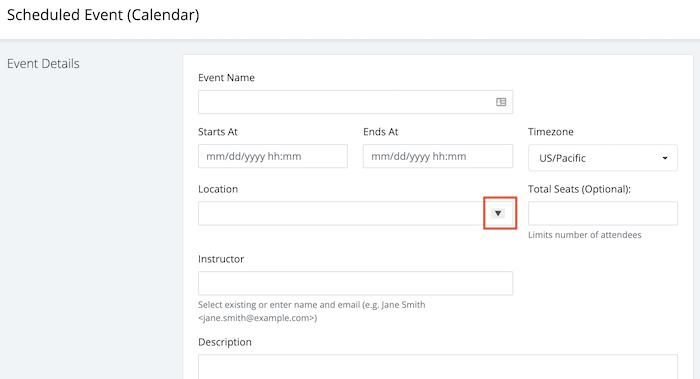 If you would like to update your locations to only include a preset dropdown list, and not allow an admin to enter in text in the freeform location field while creating a live training event, this can be set up on the back end for your organization. Please reach out to your Implementation or Customer Success Manager to set this up. If an event’s start time, end time, or location changes after it has been saved, both your students and instructors registered to the event will receive an email that identifies exactly what has changed.